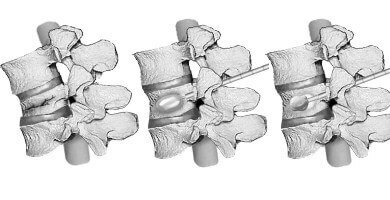 Vertebral compression fracture (VCF) happens when the spine collapses due to osteoporosis or injury, resulting to a humped back and causing severe pain. Patients suffering from VCF have two treatment options – vertebroplasty (VP) and kyphoplasty (KP). Both are mildly invasive and effective, but they also have their differences. To help you pick the right option and know the risks, here is a post about vertebroplasty vs kyphoplasty. In this procedure, the broken bones will be fixed using cement injected via a hollow needle. The aim of VP is to fix the spine’s stability. However, it will not correct its height or shape. Sedating the patient via IV anesthesia. Finding the bone fracture using X-ray. Making a small hole in the skin using a hollow needle. Fixing the fractured bones with special cement. The material will harden in a few minutes and create a cast to keep the vertebrae stable. Kypho does not only repair fractured bones, but also fixes the vertebrae’s height and shape. Aside from the cement and needle, KP is done using a balloon. Sedating the patient using local anesthesia and making him lie down on his stomach. Making a small hole on the skin using a hollow needle. Inserting a balloon catheter and guiding it to the damaged area using fluoroscopy or X-ray. Inflating the balloon and creating gaps around the collapsed bones. After fixing the abnormal wedges, the balloon will be deflated and removed. Filling in the gaps using the bone cement. In KP, the kit alone costs $3,400. This excludes the cement. That’s because it is often done in an operating room. General anesthesia is also used instead of IV sedation. The patient also needs to stay in the hospital for at least overnight, so his condition will be thoroughly observed. VP only costs $400, including the kit and cement. It costs cheaper because patients only need an IV sedation and brief observation time. If the bones are only externally damaged and its shape doesn’t need to be corrected, patients can go for the VP treatment. Once the cement hardens, the bones will be bound together in the same position that they are in before the treatment. However, if the vertebrae are too collapsed, you need to undergo KP. This process is more efficient in reducing kyphosis – a condition characterized by too much curvature of the spine. Using the balloon, the gaps between the vertebrae will be adjusted so the doctor can easily fill it with cement. Patients suffering from osteoporosis, vascular tumor and myeloma are candidates for VP and KP. However, if you have bone infections or bleeding disorders, it is advisable to look for other options for your spine fracture. Both options are not invasive, but they still pose risks. If fluoroscopy is not used properly, patients can acquire pulmonary embolism and neurological problems. This happens when the cement leaks into the spinal canal. These are the differences and similarities between vertebroplasty vs kyphoplasty. Consult your doctor first before undergoing any VCF treatments to avoid any risks.